"We hand make our woodcraft wagon bodies from the finest hardwood. The red racks are stapled & glued to assure a stronger bond. They are suitable for pleasure riding as well as gardeners, farmers or contractors. 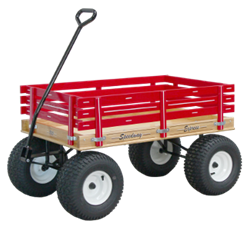 Sturdy, well-built and long lasting ... Our Speedway Express Wagons will give you and your family years of enjoyment."